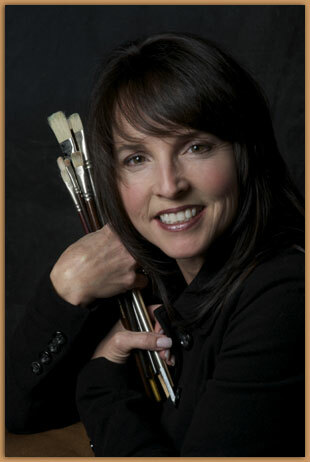 Born and raised in the Quinte region, Tess Moffat is a self taught painter who loves the outdoors. She spent her childhood summers on the shores of Lake Ontario in Prince Edward County. "It was always sunny it seemed, even if it was raining elsewhere," the upbeat artist remembers. After obtaining degrees from both the University of Ottawa and Laval University in Quebec City, she moved back home where, she says, she "met her kindred spirit," her husband, Mike. "I had always wanted a place with room to grow so that I could ride horses on my own land, hike with my dogs and run on quiet roads. Mike and I married and bought a house in the County. We found our own little piece of heaven." Tess Moffat has always been an active person. Perhaps that's why she is particularly attuned to motion and colour - the things that led her to try to capture her world in paintings. 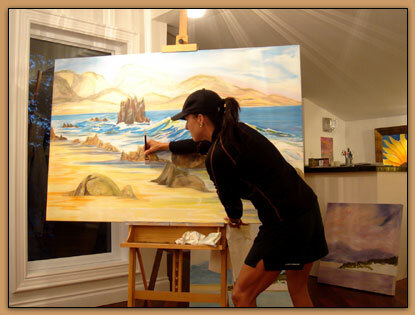 "I started painting in 1998," she said, "and I'm self-taught." "I believe that people often have a potential that goes untapped," she said. " I saw a scene when I was out walking with my daughter, and I just started painting it when I got back." Tess' background helped her develop her eye for art and the details of the world around her - particularly flowers and landscapes.